It's that time of year again! The weather is getting chilly, it's getting dark at 4:30pm (I hope you turned your clocks back this weekend or you're early today! ), and the holidays are right around the corner. I can only think of one way to make that better, and that's with a big cup of hot tea! 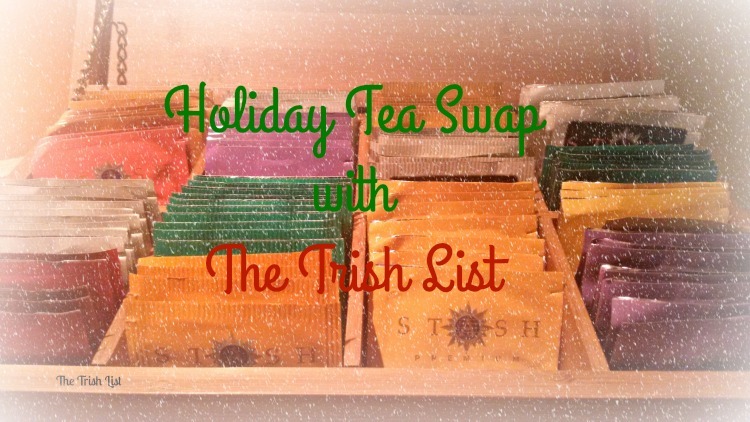 Today I am brining back my holiday tea swap. If you aren't familiar with my tea swaps, this is the third annual holiday swap and the fourth total I have offered on my site. I am a sucker for holiday teas and thought it would be fun to share my love with you all. The swap allows you to be partnered up with another tea loving buddy to swap your favorite teas. New this year is adding the option of coffee. It is not required, but you will see on the form you can check if you are open to receiving some coffee as well with your swap. You may also sent K-Cups in any form if your swapper indicated they have a Keurig. Sign ups start today and will close on Monday, November 28th. I will get all buddies emailed no later than November 30th. All packages must me mailed by December 12th. If this will be a problem, PLEASE let me and your swap buddy know. I am asking that everyone provides at least 4-5 bags of tea for your buddy to sample. You may include more. You can do this in anyway you choose, but I ask that you include a little blurb about each so your buddy knows what it is they are sampling. If you are not going to meet the deadline or have any issues, please send me an email ASAP. I want to make this an great experience for everyone involved. Last year I asked everyone to include a Christmas card with their packages since this will be arriving right around Christmas. This is optional, but a nice touch for your buddy. You may also include anything else that you feel either goes with your tea choices or you just feel like putting a smile on your buddies face. That's it! Have fun with this! Let's get the holiday season started off right! Please fill out the form below to get signed up! Happy sampling!